Transparency among major companies relating to the risks of modern slavery in their global supply chains is severely lacking, according to a new report by corporate watchdog the CORE Coalition. 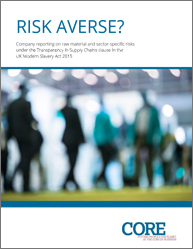 The report – ‘Risk Averse: Company Reporting on raw material and sector-specific risks under the Transparency in Supply Chains clause in the UK Modern Slavery Act 2015’ – examines the statements of 50 companies, as under the terms of the UK Modern Slavery Act, all firms with an annual turnover above £36m are required to publish a slavery & human trafficking statement. Of the 50 companies under the microscope, 25 source raw materials known to be linked to labour exploitation – cocoa from West Africa, mined gold, mica from India, palm oil from Indonesia and tea from Assam. The other 25 operate in sectors known to be at-risk of modern slavery, such as clothing and footwear, hotels, construction, football and service outsourcing. The report’s key findings include: (i) top cosmetics companies make no mention in their statements of child labour in mica supply chains, even though a quarter of the world’s mica (a mineral used to create a shimmer in make-up) comes from mines in Northeast India where around 20,000 children are estimated to work; (ii) chocolate companies do not provide information in their statements on their cocoa supply chains, despite acknowledging that they source from West Africa, where child labour and forced labour are endemic in cocoa production; and (iii) jewellery firms do not include any detail on the risks of slavery and trafficking associated with gold mining, although estimates by the International Labour Organisation (ILO) suggest that close to one million children work in gold mines worldwide. While the report focuses in the main on companies that do not report specific risks of slavery and trafficking within their supply chains, some examples of good practice are noted. Fresh off the heels of the ‘WannaCry’ ransomware attack, a fresh global cyber attack disrupted computers across the world on Tuesday and Wednesday. Russia's biggest oil company, Ukrainian banks and multinational firms across Europe, the US and the Asia-Pacific region were affected. The latest attack, known as ‘Petya’ or ‘GoldenEye’, included code known as 'Eternal Blue', which cyber security experts believe was stolen from the US National Security Agency in April and was also used in WannaCry. It is the Eternal Blue code which facilitated the speed of the assault. Indeed, the attack spread rapidly, affecting machines running Microsoft’s Windows operating systems, encrypting hard drives and overwriting files before demanding $300 in bitcoin payments to restore access. "We are continuing to investigate and will take appropriate action to protect customers," a spokesman for Microsoft said. Globally, Russia and Ukraine were most affected by the thousands of attacks, according to Kaspersky Lab. In Ukraine, government systems as well as banks, state power utilities and Kiev’s airport and metro system were all affected. Elsewhere, advertising giant WPP, French construction materials company Saint-Gobain, Danish shipping giant Maersk, US pharmaceutical company Merck, Russian steel and oil firms Evraz and Rosneft, and the Australian manufacturing facilities of the Mondelez owned Cadbury’s chocolate factory, along with many others, were all affected. In total, more than 2000 organisations are believed to have been hit. The effectiveness of this latest attack, and the speed at which it has spread, so soon after the WannaCry attack, is cause for alarm among companies, cyber security professionals and the general public. After the WannaCry incident, governments, security firms and industrial groups advised businesses and consumers to make sure all their computers were updated with Microsoft patches to defend against the threat. This latest attack, believed to be smaller than WannaCry, could be more harmful than its predecessor as it renders computers unresponsive and unable to reboot. The resourcefulness of the attackers is also a concern for cyber security professionals, particularly as Petya does not appear to have the same ‘kill switch’ which was used to neutralise the WannaCry attack. Though they are not a new development, ransomware attacks are becoming more frequent. The Petya attack is yet another reminder that many organisations are neglecting to patch their systems, allowing malicious actors to exploit weaknesses. Companies must do more to protect their networks, their data and, ultimately, their cash.